You are here: Home / #believeinbowling / The Engraver. Most see me as the tattoo artist of the bowling industry, a person who has the ability to make someone not only as unique as a person and bowler, but also give them the ability to show their uniqueness with the equipment they use. I am Rion Prise, although most in the bowling community have nicknamed me The Engraver. I am 32 years old. I was born in port Jefferson Village in Long Island, N.Y. I believe it’s not me who’s unique. What’s unique is that I’ve taken the idea of customization and brought it to a more creative and universal level. 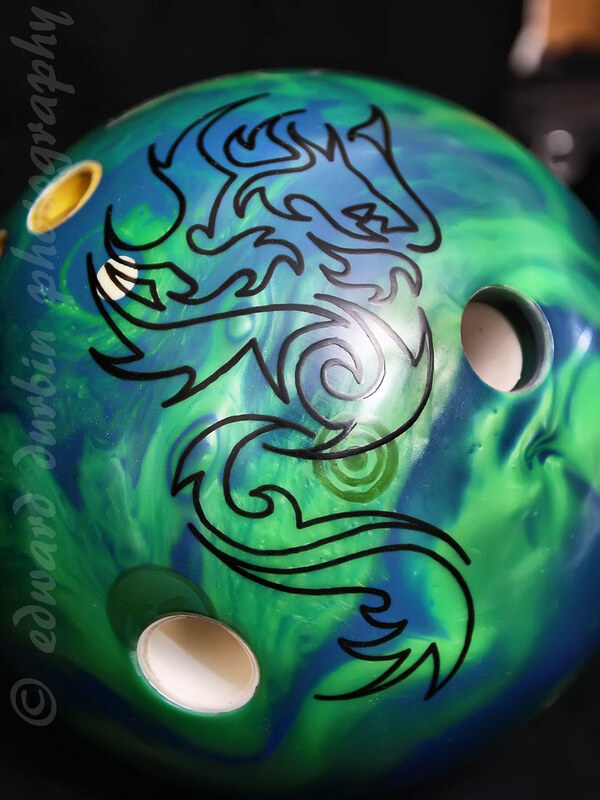 My dream is to give the global bowling community the ability to make their bowling ball as unique as they are. We live in a world of customization, whether it’s a cell phone case or a car, and people want things that reflect the person they are. Bowling balls are mass produced. Nothing separates one type of ball from the next, aside from the weight and grip pattern for the individual who owns it. What does The Engraver do? Since the dawn of the game, everyone has been able to have their names or initials engraved on their bowling balls, but in no way close to the level that I dream to bring it to. It has always been plain-Jane lettering fonts that give no uniqueness to the idea of what the individual may truly want to make the ball feel as unique as they are. Images can take anywhere from an hour and half to three hours, depending on level of detail incorporated into the image or request. For instance, the image of Thanos I did on a track 718A, took five hours. Is there a limit to the creativity? I have not applied my craft in every aspect of design and concept, so I can’t give an honest answer. Portraits of people, places and things can be difficult at times depending on the level of shading in the image, but I’m always up for a challenge. I see this as my passion in a forward movement of growth. Can you put a price on uniqueness? My technique and abilities are compared to that of a tattoo artist, and my time spent on each ball includes the same pride, effort and attention to detail as any artist. I start at $75 for the first hour and $50 for each additional hour. What’s your favorite piece you have completed? It’s honestly hard to say. I’m partial to the Autism Awareness Sash because I have close friends that endure the day to day life that comes with caring for a loved one with the disabilities Autism brings. Morally, it is the sashes I’ve done for those who have asked me for it. Image-wise, I must say the Can-Do I did for a local bartender named Kenny always makes me laugh when I see it. I must say that as this is moving along, it is coming close to what I feel could allow me to make a living doing what I love. But, like anyone, I have my fallback, and that is my landscape and masonry design and management business. Is there anything you won’t try? Basically I am open to anything, but I feel I want my images available to everyone in the industry, including children. Therefore, if someone asked me to put something inappropriate on their ball, the answer would be, “no.” But, if it was for a ball that was just for someone’s personal amusement, as a joke, or for a gift that was not going to be used in public or for a display to help recognize my work, and the price was right, then I would consider, as long as it falls within my moral standards. By USBC and WTBA rules, added engravings on the ball do make it the ball illegal for USBC and WTBA use. That being said, do you think engraving Ironman on your ball can help knock over more pins haha? Anything a person has, obtains or achieves that they truly desire in their life gives that person a sense of confidence, which has a positive effect on their state of mind. That can help the person act and/or perform at a higher level than before. With that said, do I think my work can help a person knock down more pins? Without a doubt! It’s a fact that the body follows the mind, and its state of being. Very cool. I honestly don’t know if I’ll ever have any use for your services (I’m an ex-bowler, although I would imagine your skills aren’t limited to bowling balls) but I will keep you in mind, and pass it along. Good luck in your future endeavors. Awesome Rion! You are extremely talented and really make bowling balls COOL and fun! And that is a GREAT thing! Best of luck! Also please keep me posted on your future articles, you are a gifted writer and I look forward to following your work. Hey Rion, I am interested in purchasing a bowling ball and have it customized. Can you let me know the information you need to make this happen. Thank you.